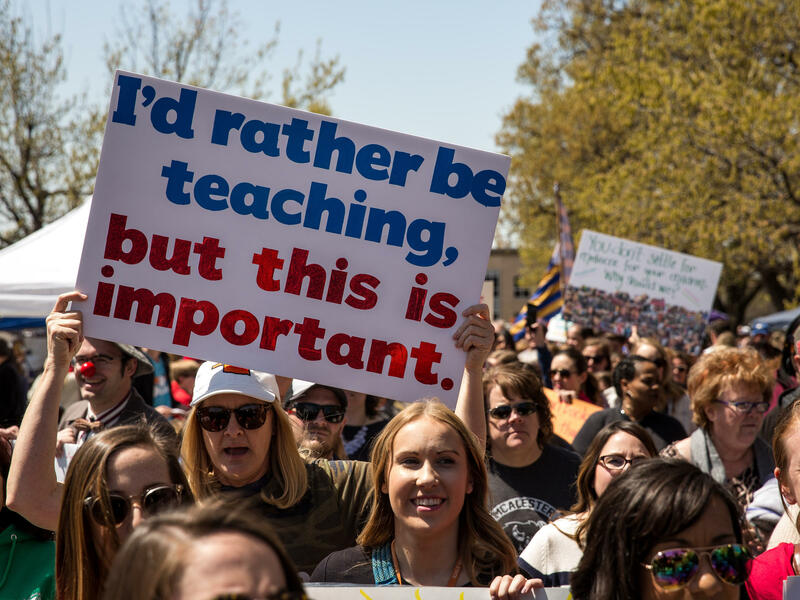 Thousands of teachers and their supporters marched outside the Oklahoma state Capitol building during the third day of a statewide education walkout on April 4. The strike ended this week. Thousands rally inside the Oklahoma state Capitol building on April 4. The strike ends amid a wave of teacher protests inspired by pay and school funding that have rocked several red states this year, beginning in West Virginia, where teachers won a $2,000 raise from lawmakers. Budgeting data from the Education Department shows that teachers earned less, on average, in 2017 than they did in 1990, adjusting for inflation. In Oklahoma, teachers make about 67 cents to the dollar compared to other college graduates. The Oklahoma Education Association teachers union originally gave lawmakers a late April deadline to implement new funding, or face a walkout. Teachers throughout the state, where union membership is optional, pushed the OEA to adopt a deadline of April 1. The walkout began on April 2 after lawmakers failed to meet the bulk of those demands, though teachers were granted a pay raise of about $6,000 beforehand. Thousands of teachers and students alike flooded the Oklahoma state Senate to advocate for legislative action of additional funding. Many teachers organized daycare for students whose parents work, and lunches for those who depend on the school cafeteria to quell their hunger. Last week, the teachers union laid out a set of specific demands they said could end the walkout, including specific legislation to restore funding cuts to classrooms. The Oklahoma state Senate announced it would take up two measures to increase education funding by about $40 million, and passed those measures on April 6. After that vote, Alicia Priest, president of the Oklahoma Education Association, said the measures weren't enough to make up for a decade of deep cuts, and demanded that lawmakers raise certain taxes to pay for additional school funding. On Thursday, Priest called for the strike's end in a press conference, saying that despite the demands of thousands for lawmakers to increase school funding, the lack of significant legislative action suggests that it's best the union aim its efforts elsewhere, such as the 2018 midterm elections. "There comes a time, when if what you're doing is not getting the results you seek, there is wisdom in shifting focus," Priest said. "While the walkout is ending today, and we're going back to school, we are not just giving up and going home." Priest said that the OEA had polled its members, and a majority said they doubted that continuing the walkout would result in more funding. She also said that the union does not speak for all Oklahoman teachers, and that non-members can continue the walkout on their own. The results of the walkout are being closely monitored in Kentucky, where some school districts will be closed due to teacher strikes next week. Arizona teachers staged a non-strike "walk-in" this week, demanding additional school funding and salary boosts. Its organizers have suggested that walkouts are a possibility.